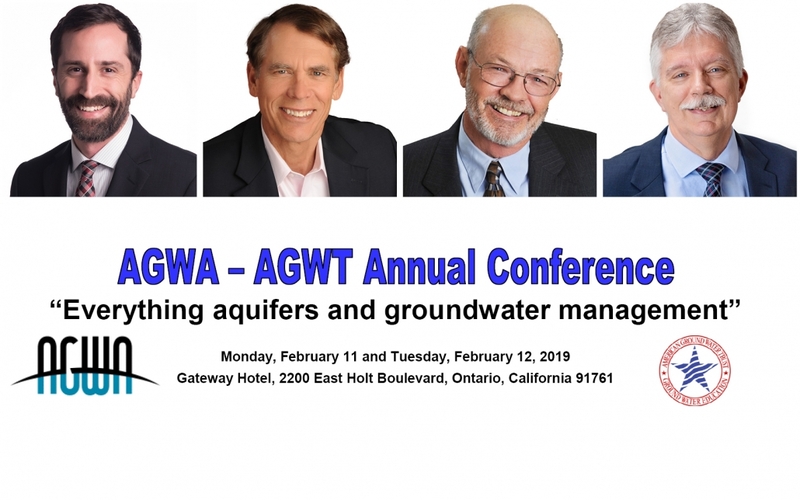 The Association of Ground Water Agencies – American Ground Water Trust (AGWA – AGWT) Annual Conference on “Everything Aquifers and Groundwater Management” will take place on February 11 and 12, 2019 in Ontario, California. DBS&A Founder and Principal Hydrologist, Daniel B. Stephens, Ph.D., P.G. ; Senior Vice President and Principal Hydrogeologist, Stephen J. Cullen, Ph.D., P.G. ; and Vice President and Principal Hydrogeologist, Tony Morgan, P.G., C.Hg., will also be in attendance. The important information exchange and networking opportunity for California’s water agencies, utilities and water districts, and for all water professionals (scientific, engineering, managerial, legal, environmental, regulatory), end-users of water, and local and state elected officials involved with water policy issues. The focus of every program is on current groundwater management issues in California. Click here to learn more about the event.